The Black Swan-Cygnus atratus is the world’s only mostly black swan and is generally associated with lakes. They are extremely numerous in the south of the country and less common in the north. A good place to see them in Perth is Herdsman Lake or Lake Monger, which are both close to the city centre. 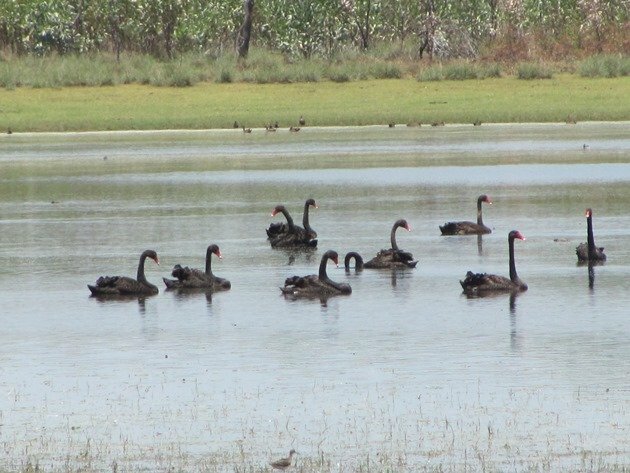 They are in very small numbers around Broome, but this week we did encounter a large group of ten at an ephemeral lake about 70 kilometres/ 44 miles from town. The above photo is of this particular group and they may remain in the area for some time or move on. The ephemeral lakes around Broome would normally dry up each year, but with our unseasonal rain in June this year they did not and it made for an interesting year for birding the area. 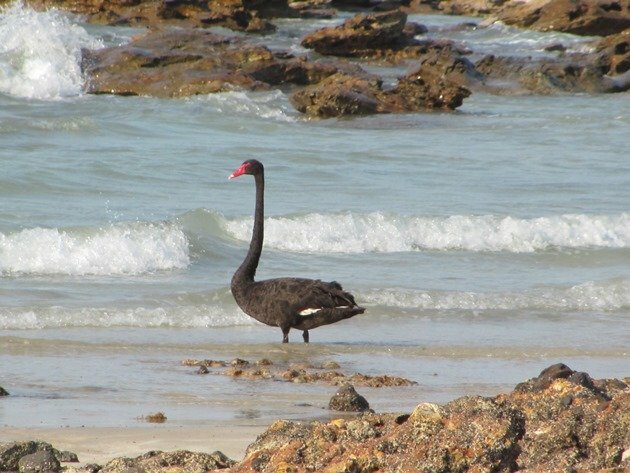 You would not expect to see Black Swans in the ocean, but on several occasions we have observed this and there does not appear to be an obvious explanation why they would be seen floating around in the Indian Ocean. The ocean would be a lot cooler than the relatively warm waters at shallow lake systems, but there would not be the food required and it is doubtful they spend a great deal of time in the ocean. We have observed them in very deep water amongst boats in other years. 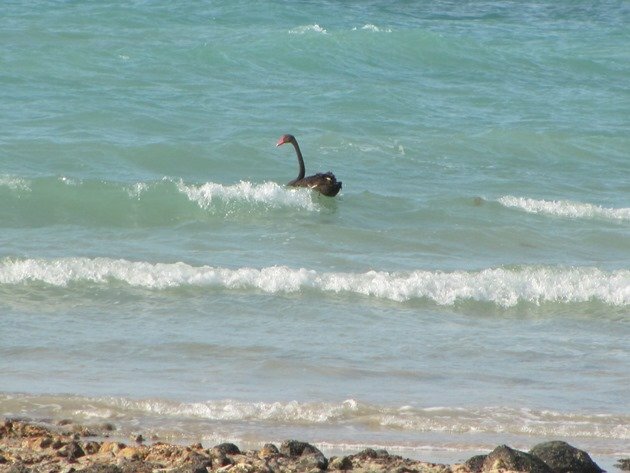 Our most recent experience was of a lone Black Swan resting on the shoreline and then waddling out to float around in the surf for some time before returning once again to shore. It was a very hot day and no doubt if this is the first water you have encountered for some time then you would take the opportunity to cool down. There appears to be no knowledge on how far a Black Swan might travel, but they are nomadic rather than migratory. Climatic changes will determine where you are likely to find them and they appear to travel a lot further than originally thought. 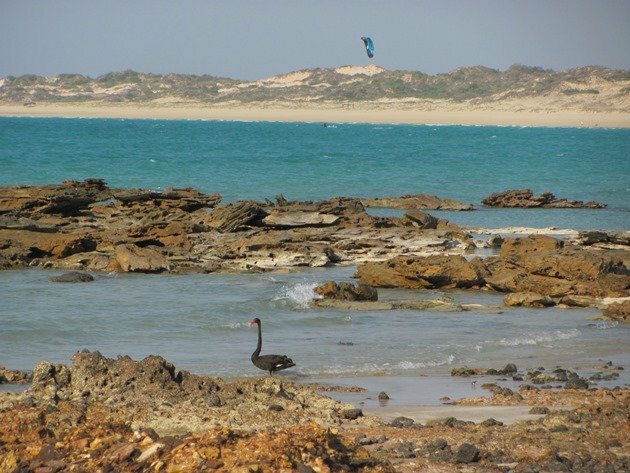 Below are the photos of the Black Swan enjoying the surf at Gantheaume Point in Broome late in the afternoon. 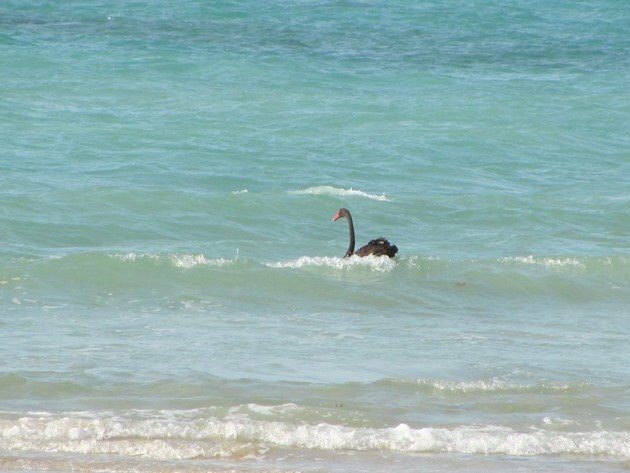 Black Swan heading off for a surf! 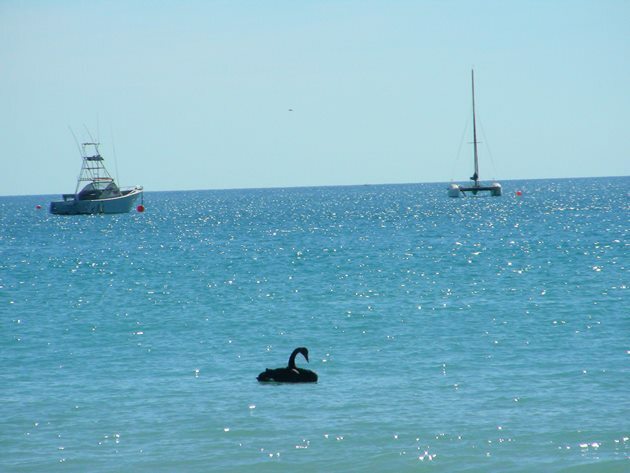 The Black Swan is the Western Australian state and bird emblem and features on our state flag. I often see Black Swans in Poirua Harbour here in NZ too. What a magnificent bird and amazing it’s in the ocean! How cool to have it represent your state. The first Black Swan I saw was in a park in Barcelona when I was at university there. I wonder if it wandered there, too? 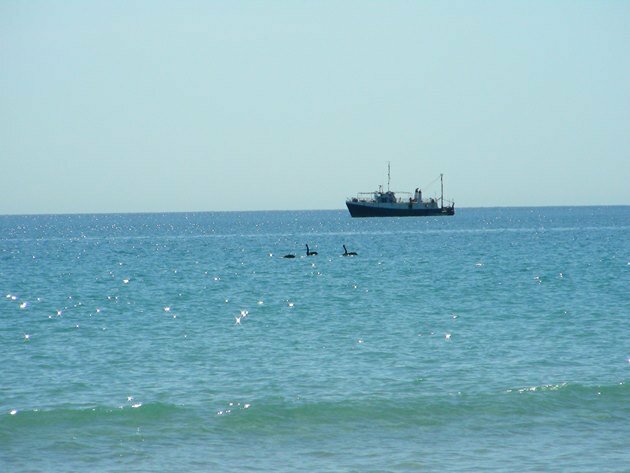 I was surprised to see them in Port Phillip Bay (Melbourne) the first time I saw them there, but they are often not too far off shore there. I have just come home from a swim at Coogee Beach WA and there was a lone swan “swanning” around the beach here in Cockburn Sound! That’s great! 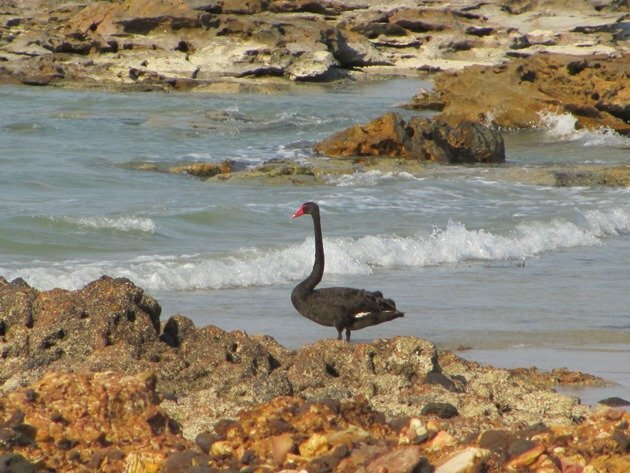 There is a lack of Black Swans around Broome at the moment! Maybe they will come soon, because we have had some good rain recently and the lakes have filled up again.